National or the public library of Bermuda is located in front of the Queen Elizabeth Park on Queen Street. This old two storied building with a balcony used to be the residence of Perot family. Perot was the first post master of Bermuda. 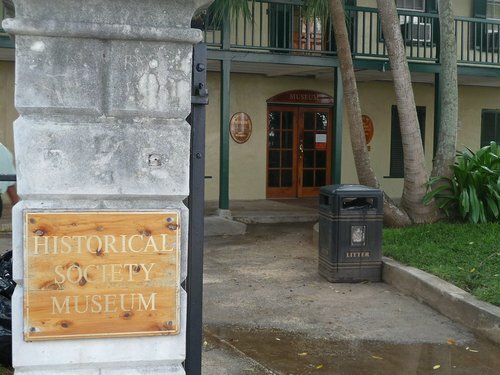 Bermuda National Library was founded in 1839 by the governor William Reid. It was then housed in the cabinet building. In 1919, it was shifted to its present location of park. The library initially started with only 276 volumes which were mostly donated by the Governor. In the reference section you can find microfilmed newspapers dating back to 1784. There are some rare collections of books like the General History of Virginia, New England and the Somers Isles, by John Smith, a 1624 edition. There is also a map of Bermuda dating back to 1624 that shows the division of the island by Bermuda Company into 25-acre shares. You will also see a portrait of william Perot and his wife to whom this home once belonged. In 1997, the building went through some renovations. An elevator has been added to allow wheelchair access to the second floor where the lending and the reference sections are located. Services offered by the main library includes access to large collection of books and magazines, audio and video materials on CDs, DVDs, Playaways etc. The library also offers free internet access to both members and public through one of its 5 internet terminals. One can use the internet 30 minutes per day. However there is free unsecured and unlimited wi-fi also available. The internet terminals also have printing facilities at a cost of 25 cents per page. You can also read daily and other new papers on micro films. There is also a workstation loaded with microsoft office and available for public and members. The Bermuda Youth Library for children of age up to 18 is located close by at 74 Church Street. The library's collection is over 13,000 books and membership to the library is over 4,700. Services includes Parent-Teacher resource collection, School & group visits, Storytimes, Summer Reading Program, Newspapers & magazines, Audio books, Foreign language books, Aquariums, free internet access on PCs, Photocopying facilities etc. Update March 2014: Bermuda National Library has recently added lots of eBooks and Audio Books which are available to members. The books cover wide range of subjects including fiction, travel, history, novels and lot more. The digital collection also has Bermuda Recorder between 1933-1975 and Royal Gazette daily newspapers between 1784-1899. Update November 2014: As part of its 175th anniversary offerings, the national library has introduced online tutors for local students or those having online access and a library card. Everyday between 3pm to 11pm, individuals can connect online with experts for a session of up to 20 minutes each. The experts will guide students, assist in homework or even help making a resume. The online experts are available even on most holidays including Sundays. One needs to visit the Bermuda National Library website (www.bnl.bm) and access the link Tutor.com for online assistance. Update December 2014: The Limbo Up foundation has donated over 4,500 classic films in DVDs to National Library. Having transferred all the films, the library of Limbo Up Foundation has closed down. Recently a wall to wall painting of underwater marine life and painted by artist Manuel Palacio has been installed at the Youth Library. Monday – Thursday 9:00am-5:00pm; Friday 10:00am – 5:00pm; Saturday 9:00am-5:00pm. 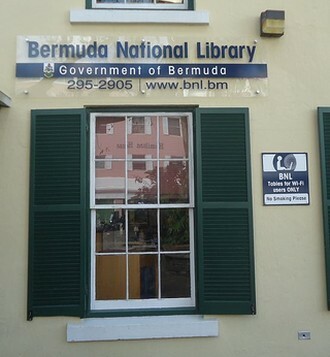 Bermuda National Library located in Hamilton city on Queen Street next to Perot Post Office. Address: Queen Elizabeth Park, 13 Queen Street, Hamilton. The Adult Library's main line: (441) 295-2905. The Adult Library Circulation Desk: (441) 299-0029. The Information Desk (reference): (441) 299-0030. The Youth Library's front desk: (441) 299-0020.